You’ve probably seen it in the headlines: homeowners are refinancing in record numbers. But what’s causing this enormous new trend? If you’re feeling left out of the loop, we’re here to show you some of the reasons so many people are You’ve probably seen it in the headlines: homeowners are refinancing in record numbers. But what’s causing this enormous new trend? With the long-term downward trend we’ve witnessed, low rates aren’t catching anyone by surprise. Homeowners who benefited from their own refinance are spreading the word, and rates remain low or get even lower for the new applicants who follow suit. Many people make their decision to apply for a refinance based on a combination of their personal situation and changes in rates. You can actually set up a rate tracker to help you stay on top of the trends yourself. The British referendum to leave the European Union has caused a big stir internationally. As a result, rates have dropped even lower than they already were, and they’ve come low enough that most homeowners couldn’t possibly hold out for much better. Naturally, rates change frequently depending on many variables, but you can easily get a rate quote right now without any hassle. With this information in hand, it’s possible that you’ll find yourself in a position to take advantage of current trends, too. One of the forces previously preventing many homeowners from refinancing was the value of their homes. Many homes purchased before the 2008 housing market crash are just now regaining their value from that time. A home that is worth less than the mortgage cost would force a homeowner to come out of pocket in order to refinance; this is not a very ideal situation even when rates are low. But home values are generally still increasing, and now many of those homeowners have paid down the principal and gained some equity. Like we mentioned before, most markets are actually meeting or exceeding pre-2008 levels, which for many is the cut-off point where a refinance goes from a wish to a reality. If you want to see what your home is worth, you can get a home value report. Of course, you’ll have to get an official appraisal to refinance, but a home value report can be a great indicator of whether it’s even worth pursuing. Perhaps one of the most important things we take for granted is that it’s really not hard to get a mortgage refinance. With a little knowledge and the help of an experienced loan officer, most homeowners can take advantage of a refinance right away. 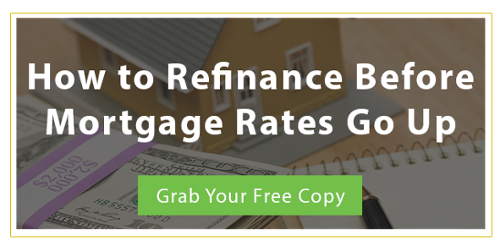 Click the button below to download our ebook on how to refinance before rates go up. No cost refinance: is there a catch?